Sometimes people end up somewhere they never thought in a million years they would be. Such is probably the case for Cleveland native Brian Sims who now finds himself living in Youngstown attending Youngstown State University. 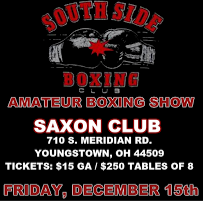 Sims, 24, has gone from a young man trying to adjust to the college life to becoming a fixture on the Youngstown amateur boxing scene in a short period of time. Those who have seen Sims box would think he's been doing so since he was a teenager. That's the furthest from the truth, however. "I picked it up in Youngstown," said Sims of boxing. "I've been doing it for about three years now". So how did Sims end up in Youngstown at Youngstown State University upon graduation from Euclid High School? "Honestly it was the only school that accepted me," Sims said with laughter. Luckily for Simms, everything has worked out well with Youngstown State University, as the now senior is on pace to graduate with a degree in communications. "I want to go into broadcasting, but I got a year left giving me enough time to figure it out," said Simms of his post-college plans. A career in broadcasting is not the only thing on the mind of Sims, however. 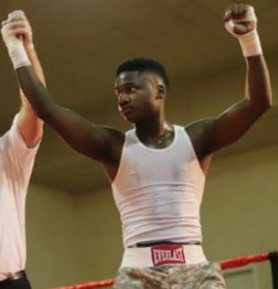 "I plan to turn pro a couple years after I graduate," Sims said of his boxing career. "I'm still a young buck in the game and need some time to perfect my craft and in about two or three years I should be a pro" Sims continued. And after living the past four years in Youngstown, what does Sims think of the city? "It's a city on the rise, I've seen a lot of stuff from when I first got here four years ago". Beatings show at the Saxon Club in Youngstown. Though nothing is finalized yet, Sims is slated to take on Julian Salinas who will be making his return to the ring for the first time in three years it what could be an interesting and fun match. Tickets for the show are $15 and can be purchased at the door. I'm so proud of you! You are on your way to great things! Love you much!